The Integratron is a structure designed by ufologist and contactee George Van Tassel. Tassel claimed the Integratron was capable of rejuvenation, anti-gravity and time travel. He built the structure in Landers, California (near Joshua Tree), supposedly instructions provided by visitors from the planet Venus. 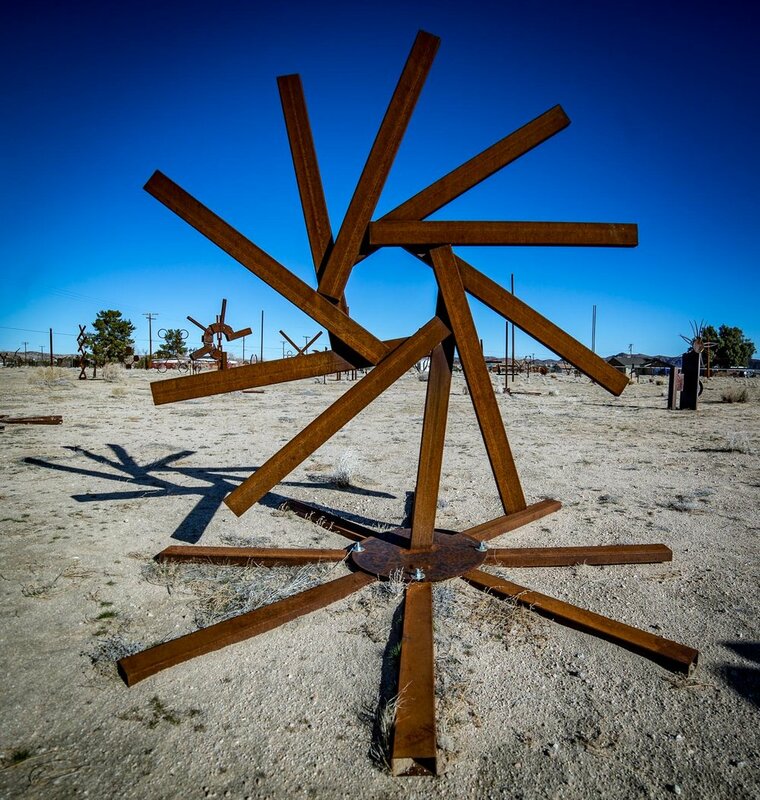 Located in an isolated area in the outskirts of Joshua Tree, the Noah Purifoy Museum is an open field of "Assemblage" art (previously known as Junk Art), consisting of mysterious and disturbing forms which are open for the viewer to immerse themselves into. On Saturday mornings, there is a very nice Farmers Market in Joshua Tree on Hwy 62. This is a Certified Farmers Market, so there are strict rules - the merchants can only sell locally grown or created items. Simi Dabah, a self-taught artist/welder, has been creating welded steel sculptures from industrial scrap for more than forty years. He is a prolific artist who believes that using scrap materials to create works of art is both friendly to the environment and inspirational to the viewer. His sculptures include a wide spectrum of nonrepresentational designs, and range from table-top size to more than 20 feet high. Most of the outdoor pieces are left in their natural state rusting to a warm patina. Considered sacred by Native Americans of Joshua Tree, Giant Rock is a large freestanding boulder in the Mojave Desert near Landers, California, that covers 5,800 square feet of ground and is seven stories high. Giant Rock is purported to be the largest free standing boulder in the world. Some people think Shari makes these crochet animals. She does not. You see, she doesn't really know how to knit or crochet. However, she wants to learn. She recently had a lesson with our "Art, Not Walmart" group where she learned how to make a long crochet chain. She's pretty happy with this new ability and she thanks Suzanne for the lesson. When you arrive in JT, you'll notice that there are no Fast Food restaurants, no "Super" markets and no High Rise Luxury Condos in the town. This is by design. The residents have worked very hard to keep their town authentic. Note: Salvation Mountain is a 2 hour drive from Joshua Tree. "The Park" is a massive desert. It's over 790,000 sq. acres. It fact, it's bigger than the state of Rhode Island. Yes, it's Magical. Yes, it's Amazing. Yes, it's Freaky - but it's still a desert. And like most deserts, it can be hostile and unforgiving.